Teaching you how to make moonshine one step at a time! To learn how to make moonshine you will first need to learn the difference between a pot still and a column/reflux still and decide which type you will use. Both a pot and column still have advantages and disadvantages and which one you decided to use largely depends on the type of liquor you are thinking of making. Lets have a look at how a column still works, what type of alcohol it will make and how you can make one at home. How does a column still Work? 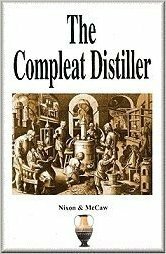 What types of liquor is made with a column still? A column still is predominantly used for making clear spirits such as vodka, white rum and London dry gin. For recipes and step by step instructions on making any of the above spirits check out our “Moonshine recipes” . How to Make a Column Still ? A column still is a must for anyone just starting out. It’s more complicated to build then a simple pot still however it is the most useful still as you can easily create a flavourless base spirit using our simple moonshine receipt. Once you have a base spirit flavours can be added to create many different sprites including, gin, whiskey, rum, malibu, jagermeister, and countless others. Where can I buy a column still? Hillbillystills.com – These guys make hand crafted column and pot stills that look amazing. They will create an identical product to the homemade still above the only difference is that it will have a slightly higher curve appeal and price. 7 Responses to "Column/Reflux Still"
I,m just starting out on distilling have built your still.i have a 25 late wash fermenting how many litres of vodka should I get from the still before watering down. I am wanting to build my first still. But what can I do to improve the design itself to produce the highest proof/yield? I would follow one of the still plans I’ve already posted. If it’s your first still build I wouldn’t alter things to much keep it simple once you understand the basics then start experimenting a bit… IMHO Altering column width, height and packing material will alter the efficiency of the still ! i have made some really good rum . I ALWAYS do a stripping rum first This pulls all or most of the useful stuff from the mash. Next i toss out the mash then slowly re distill my clear liquid getting a very potent result this then goes into jars with oak chips or what ever your flavors are you do not want to drink it as is as it will burn your stomach cut it to 80% with distilled water . this gives a pleasant drinking spirit. I have just built a reflux still using your plans,have just finished my first wash and am now ready to distill this.I have used an electric heater to heat the liquid which is run thro a controller.what I am not sure about is temperatures obviously the methanol burns off first and the the ethanol so could you please tell me if I have to set the temperature to 64c to burn off the methanol and then increase the heat to 78c to get the ethanol any advice would be much appreciated thanks Steve. You need to set the temperature at about 80 degree C or something close to that depending on the alcohol content of the mixture produced by your fermentation. The vapor point of the mixture is what dictates the separation of the volitiles, not the boiling point of the individual compounds. In a five gallon batch, throw out the first 4 ounces, to insure the removal of the most volatile methanol & acetones. Reduce the mixture temperature to stabilize & maintain 3 to 4 drips per second thru the condenser to produce high proof alcohol. After a period of time 2+ hours, you will notice a gradual increase the the boiler temperature. This will tell you that the hearts collection is near completion, and that you are in the tails stage of your distillation. You may notice a milky color or weak taste when the tails stage is in progress. Check with a hydrometer to check your proof. 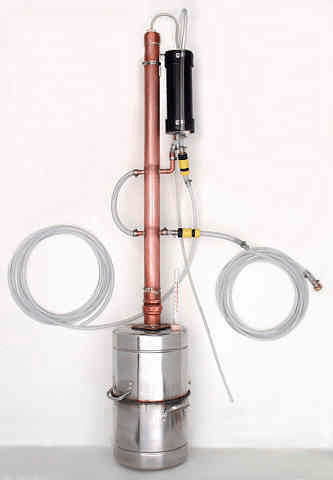 How To Solder, Braze And Weld Stainless Steel To Copper – In 5 Easy Steps! Grand Pappy’s 4-Grain Liquor Recipe – Everyone Will Love This One! Is Moonshining Legal In Canada ?